I have decided to start a wish list here. It will be recurring and perhaps at some point I will assign it a particular day of the week. But for now, I will enter randomly. Besides the intangibles that everyone wishes for such as good health and our children’s happiness and success, this list will include wishes ranging from the now obtainable to the someday obtainable and in another life obtainable. Most of the time the entries will be tangibly obtainable items but I will start off with an item in a more ethereal category. My first wish is to be a character in a Nancy Meyers film. How great would that be! Now I’m thinking more along the lines of It’s Complicated, Something’s Gotta Give or even Parent Trap (which I have caught my husband watching by himself on numerous occasions). All the female leads are 5o something (a bit younger in The Parent Trap) smart, attractive, witty and successful women who own their own creative businesses. They are independent, aesthetically fine tuned, have great relationships with their kids, and find great men in the end, although they’ve proven they can live perfectly well without them. And certainly not last on the list, they get to live in those fabulous houses – I vote for Diane Keaton’s now famous Hamptons House. 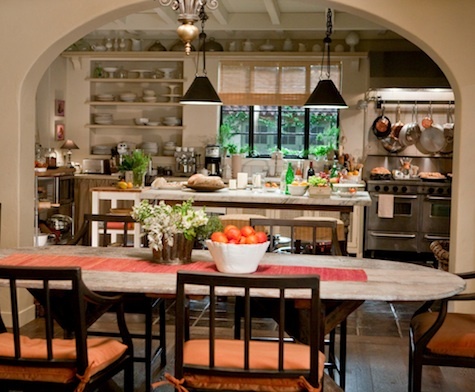 That has to be one of the most copied kitchens of all time. Although the others weren’t bad either. London townhouse from The Parent Trap below. For any of you who didn’t see it, here is the link to the terrific New York Times Sunday magazine article about Nancy Meyers that was published last December. And I guess this falls into the in another life obtainable category – well a girl can dream can’t she? 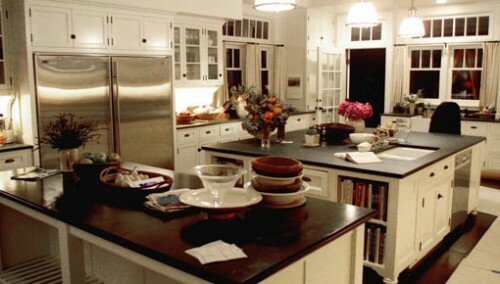 This entry posted in architecture, film, interior design, kitchens, wish list. 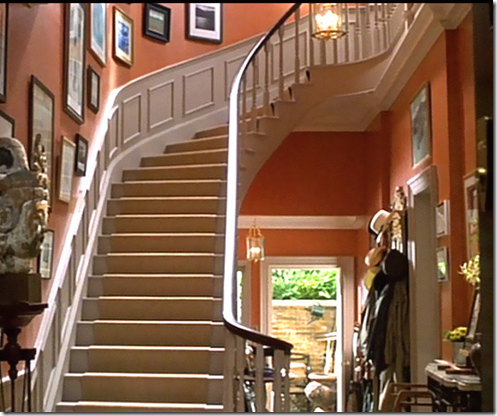 Entry Tags: Favorite Movies, Interiors in Nancy Meyers Movies, It's Complicated, Kitchen From Something's Gotta Give, Movies With Great Interiors, Nancy Meyers, Parent Trap London House, Something's Gotta Give Bookmark the permalink. You’re too kind – I’m already anxiously awaiting her next movie! Jane – and make sure you get a good luck at the California ranch also – pretty spectacular! Love Nancy Meyers films and her female leads! Especially since they all seem to have a great sense of decor (unless they’re hiring a fabulous interior designer!) Thanks for stopping by The Buzz! Hope you’re having a wonderful weekend. Carolyn – Yes, love them all. Production designer John Hutman and set designer Beth Rubino are brilliant!!! Might be a good day to watch a movie – I think it’s going over 90! Love this post! Keep up the great work! Hi Rebecca – so glad you like it – thanks for stopping by!! 83 queries in 0.460 seconds.